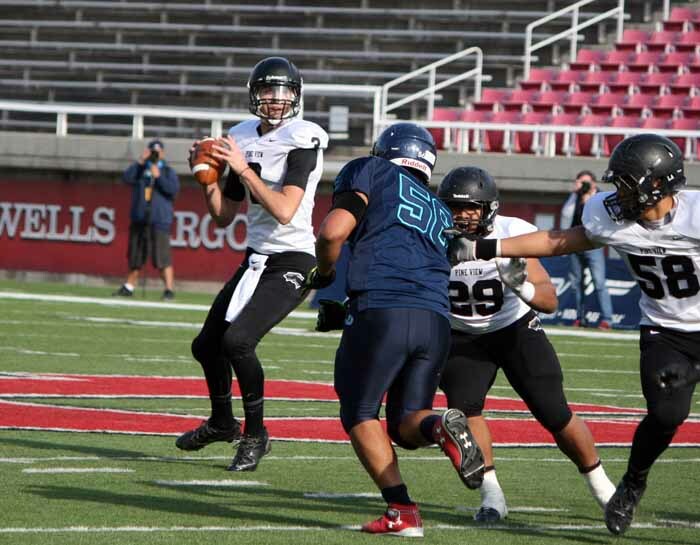 Editor’s Note – Originally published three years ago, November 11, 2014, here is a feature on current BYU quarterback Kody Wilstead, from his high school days at Pine View. Now, returned from his LDS mission, the Cougars are apparently thinking about pulling his red shirt to get him on the field this year. If he had followed the typical Wilstead family path, Kody Wilstead would be seeking fame and fortune as a baseball player, but the Pine View High quarterback didn’t take much to the diamond, so he sees his future in the sport of his passion. Outside of the success he has had on the gridiron, what made an amazing three-sport athlete walk away from his family’s favorite game? The 6-foot-6, 210-pound Wilstead also excels as a basketball player, but it took some time for him to learn to love that game. It seems for Kody, it’s all about being in the middle of the action. Fortunately for Wilstead, his passion has led him to excel in the game that is his first choice, and after a mission to Argentina for The Church of Jesus Christ of Latter-day Saints (he leaves Jan. 14), he will follow his brother Cole to BYU. He will just be seeking to make headlines in a different arena. 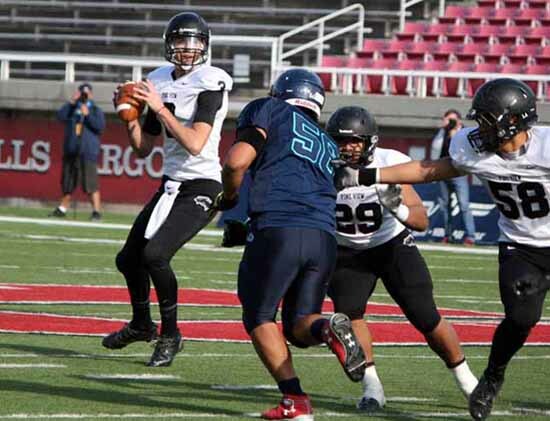 It was clear from the moment he walked on the field at Pine View that Wilstead was destined for greatness as a quarterback. He got some situational playing time with the varsity even as a freshman and was set to be the starting quarterback as a sophomore until a broken leg put him on the sidelines for much of that campaign. So 2013, his junior year, was the signal caller’s first full season as the leader of the Panther offense, and he put up some big numbers. Completing 62 percent of his passes as a junior, Wilstead passed for 4,390 yards by the time the state championship game was over, and had 36 touchdown passes. All of that came in a year that finally ended with that state final loss to league rival Desert Hills. That game, and others along the way, made Wilstead into the more complete player he is today. 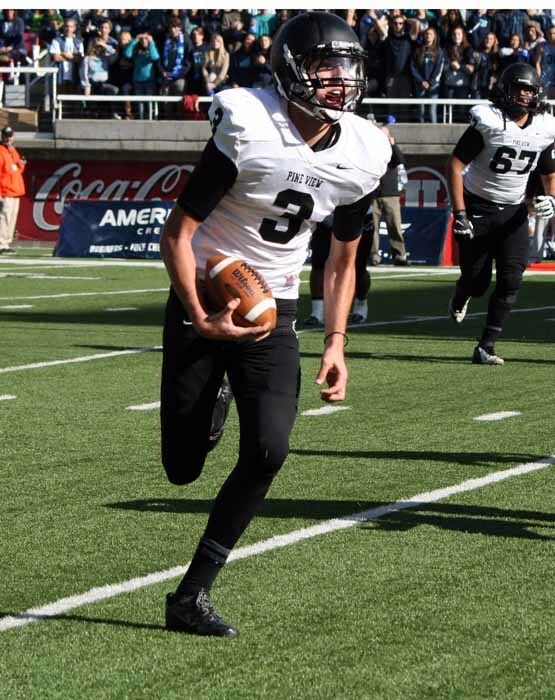 “His maturity (is the biggest change),” said Pine View head coach Ray Hosner. “His ability to read defenses. That’s been the biggest thing for him is to recognize what people are trying to do. Wilstead doesn’t run the ball a lot, but he has learned that he can use his legs to assist in the passing game. While you don’t see the Panther quarterback piling up rushing yardage like some of the other passers in the state, it’s not because he doesn’t like to tuck it and take off. Earlier this season, in the regular season rematch with Desert Hills, turnovers cost the Panthers a shot at revenge. There were lessons to be learned and one big reminder for the gifted Wilstead. Perhaps it is that trust in his teammates that has contributed to the statistical differences from 2013 to this season for Wilstead. A year ago, he had six games in which he passed for more than 400 yards, but there were also 17 interceptions. This year, he has passed for more than 400 just once, his career-high 501-yard game against Dixie, but thrown just four picks. Those numbers are also helped by the ongoing presence of Pano Tiatia, an outstanding running back. And in the passing game, Pine View has weapons all over the field, with Bladen Hosner, Colton Miller, Blake Ence, Preston Allen and tight end Steve Bangerter all bringing different sets of skills to the field. 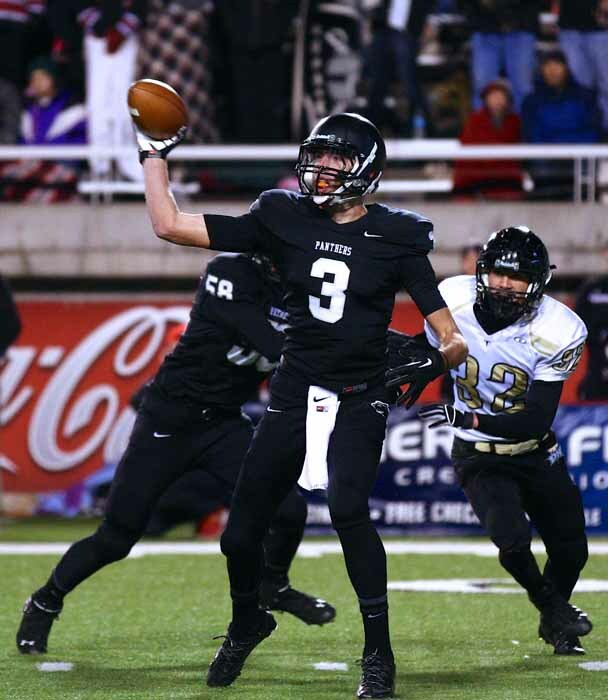 The 2013 3AA state semifinal was a shootout in which Pine View eventually outlasted Juan Diego 48-42 in overtime. There was a moment in the closing minutes of that contest when a victory seemed all but impossible. After the Panther defense essentially opened the gates and let the Soaring Eagle take it to the end zone for an eight-point lead, Wilstead and his offense answered, got the two-point conversion and eventually the win. In the end, his love of being in the middle of the action is what makes Wilstead thrive as a quarterback. Pine View fans are happy he found the position that kept him in the game.